Niccolo Bonifazio is a stand out contender for stage honours on the second day, as the Italian seeks to increase his tally of major career wins in 2016. As ever, his team Trek-Segafredo have assembled a team which shall not struggle to meet the demands of leading Bonifazio out and shall be confident of securing at least a podium spot on Stage 2. Kristian Sbaragli is an extremely talented finisher, one who could challenge for the win today and subsequently begin his campaign upon the points jersey. An attritional race would improve his hopes of winning here, but it remains a big test as to whether or not he can beat rivals typically faster than him so early on in the race. Beyond those mentioned above, there are an array of teams who shall all seek to secure a victory early on at this year’s edition of La Vuelta a España. 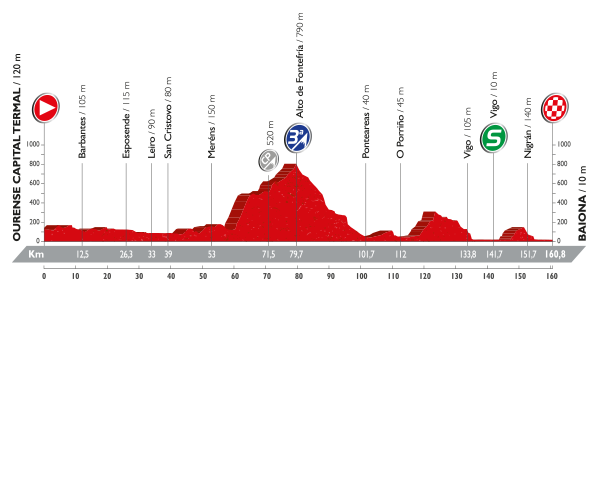 Tosh van der Sande, Gianni Meersman and Jose Joaquin Rojas all have the potential to steal the win here, making them dangerous riders who will need watching by the bigger name sprinters’ teams. Posted on August 21, 2016 August 21, 2016 by Spokenforks	This entry was posted in La Vuelta a España 2016, News and tagged 2016, Baiona, Gianni Meersman, José Joaquin Rojas, Kristian Sbaragli, La Vuelta a España Stage 2 Preview 2016, Niccolo Bonifazio, Nikias Arndt, Ourense Capital Termal, Preview, Spokenforks, Stage 2, Tosh Van Der Sande, Vuelta a Espana. Bookmark the permalink.